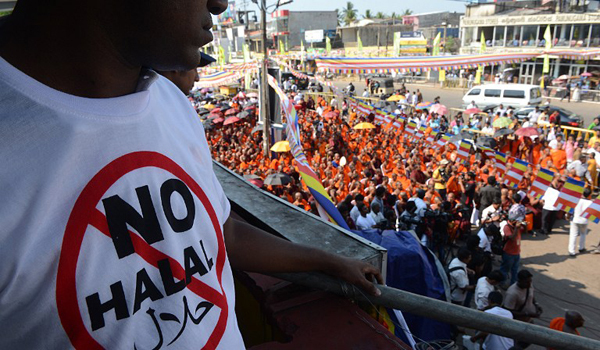 Bodu Bala Sena (BBS) and its supporters at a rally in Maharagama, Sri Lanka. Published originally on Groundviews and subsequently on Firstpost. The growing anti-Muslim sentiment in Sri Lanka is pushing us to respond in numerous ways: we are talking, flustered, hopeless and helpless, shouting in outrage (when no one will listen), holding our knees to chests, trying to pull ourselves inside, into some sense of comfort and safety, whispers of more war, more conflict on our lips. The annoyance has turned to fear; the irritating din of the crowd has turned to the cries of a mob. In a matter of months, we have grown from worried to scared; that mob have grown from an absurd joke into a very serious problem. Worst of all, it has pushed some of us to retreat into the empty shells of ourselves, hiding our heads, hoping it will just blow over. Here, at the threshold of this calamity, we teeter on the edge, about to make our most grave mistakes all over again; it may not blow over before it has destroyed so much more than we are willing to sacrifice. The Bodu Bala Sena and Sinhala Ravaya and other similar groups obviously have a clear agenda – we are done with the Tamils, so let’s make the Muslims our new enemy. This suits the agenda of our current regime, in fact they were just done with a civil war and wondering how to keep the masses further mesmerised, hypnotised – fear of a common enemy, naturally, is just the way they’d like to do it. These are dangerous, violent hate-groups that seem more sinister with each passing day, as it becomes clear that they are willing to attack their ‘enemy’ in the most horrific of ways. They are prepared not just to physically hurt people, their homes and their properties, they are willing to engage in the most lowly kinds of attacks; humiliating people and ripping them of their dignity, attacking their beliefs, rituals and faith and inventing and spreading totally ludicrous lies to demonize them. It’s school-yard bully stuff, medieval stuff – totally unsophisticated, totally cruel, and yet totally effective in creating fear when you have the numbers on your side. It’s made more dangerous by its very public association with the highest powers that be, who have condoned their actions and ideology by giving in to their petty, unreasonable demands and never once publicly condemned them. So while most Sri Lankans are crushed beneath the weight of every-day life – the cost of living, corruption, lack of civil liberties and rights – our ‘great leaders’ are able to prey on our innermost frustrations, fears and insecurities, turning it into a hatred of ‘the other’ and thereby drumming up support for this dangerous campaign of hate. They are fooling us; distracting us from the harsh realities of life in Sri Lanka; distracting us from a crumbling economy, a faulty and unsustainable faux-reconciliation process and the fact that they have categorically been accused of war crimes and crimes against humanity. Our responses to this violence are varied as they are fascinating. Don’t they remember July 1983, you ask. They don’t care. Don’t they remember how marginalising and victimising an ethnic minority led to a civil war of nearly 30 years, you ask. They don’t care. Remember how we all suffered? you ask. Do you want another war? you ask. Maybe they do. Most often, we avoid delving into the deeper issues; we try to avoid feeling the deeper things. We want to prevent another war. We want to prevent another catastrophe – but only so we don’t have to suffer on behalf of someone else. Let’s for a moment put aside the larger questions about racism and fascism. Let’s put aside everything we know about every civilian’s right to life, the right to protection from the state from discrimination. Let’s put aside the right every one of us has to pursue any religion we like and freely engage in the worship of any faith without the fear of persecution. Let’s instead consider how one could draw glaringly obvious parallels between this situation and other horrific moments in our own history as well as the histories of other nations and other peoples. Let’s at least consider the fact that this could affect every one of us personally if it goes unabated. If it’s hard to muster up the courage and the determination to fight for the rights of another community just because you should in principle, let’s at least consider the fact that none of us will survive more ‘ethnic conflict’. Prejudice has no logic; it is an irrational hatred born from an irrational fear of the unknown and we are all complicit in different ways. It’s moments like this that require every single one of us to step up and take some responsibility, to care. Think, talk, act, now. Do your bit, do whatever you can. Disassociate yourself completely and publicly from individuals/organizations that support these campaigns of hate; and when you do, tell them why. Talk back, debate, get angry with the people who think it’s OK; it’s never OK. Find out everything you can behind the ideas and agendas of these campaigns, keep yourself informed and always ensure the information you’re getting is accurate and unbiased. Share this information. It may not seem like there’s a lot you can do, but it’s time to pick a side. This is not the time to be non-partisan, undecided or apolitical. There’s a lot that extremist bigots are willing to do that peaceful moderates are not, but conviction should not be where we come up short. The battle lines are being drawn. The fundamentalists are always quick to do so. Where do you stand? A rare voice of reason. Thanks. Agreed. The time is now. Sri Lanka must stand united.